Manufacturer of a wide range of products which include gx6-14 scrap straightening machine and scrap straightening machine. Facilitated by the technically advanced process, we are manufacturing an excellent quality gamut of Scrap Straightening Machine. 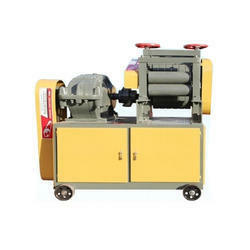 This is widely known for maintaining the quality of its offered range of scrap straightening Machine in this industry. It is able to straighten scraped rebar with high efficiency. We manufacture this at our technically sound production unit using optimal grade materials in accordance with industry norms. Our quality inspectors test this Scrap Straightening Machine on several parameters before dispatching at clients end. Scraps produced at a construction site are always a cause for worry. Scrap Straightening Machine can help you reuse your steel and save on scrap.